This type of holographic table will be your battlefield in League of War: VR Arena. 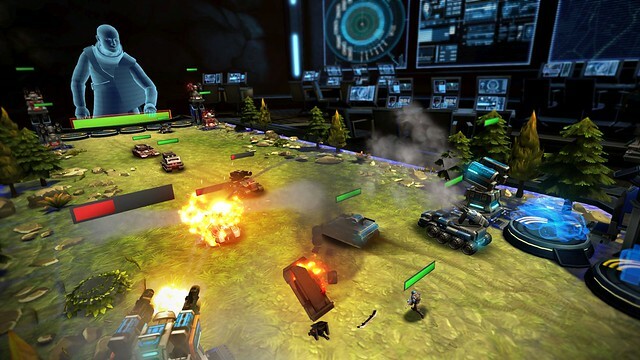 Send units against the enemy commander in the hopes of beating out their opposition and taking the victory. Does this game offer a rich and deep strategy experience in VR, or does this tabletop feel a little flat? The campaign in League of War: VR Area has you playing as various commanders who go through a series of battles with other commanders. Each mission opens with your chosen commander narrating a short introduction about their opponent and their reason for fighting. You can skip these, but they're not very long. While each commander has their own unique voice and accent, their introductions aren't very enlightening. There's a small amount of mystery and intrigue, but it's not enough to really pull you into the story they're trying to tell. It's a brisk method of storytelling that lends some character to the various commanders, but it doesn't tell a cohesive story overall. I would have loved to see an interwoven story that connects all of the commanders together by a consistent thread woven into each of their stories. Instead, the narrative here is a series of disconnected narrations, with some small references to commanders you've played before. It's not going to sell the game based on story alone, but I imagine most of us are here for the gameplay, so let's find out how that stacks up in VR. League of War: VR Arena is a game that lays a very strong foundation for a concept and performs very well, but it doesn't take that second or third step towards true depth and longevity. Each battle begins with you standing on your side of the table, spawn pads are below where units will appear. You have a great 3D view of the table ahead, and a hologram of your opponent on the opposite side. Four automated turrets protect your side of the table, and a health bar sits at the bottom below you. Once the battle begins, the pads will begin charging. Once a unit is available, you can reach down with your PlayStation Move controllers and pick them up. As you place them on the table, a line will allow you to point them at the unit you want them to attack. The color of the orb on your target gives you an idea of whether you have an advantage. A green orb is ideal, as it means you have the upper hand in that scenario. It's a basic rock/paper/scissors mechanic where one unit beats another and they are in turn weak to another type. There are multiple types of each, but the categories fit into infantry, vehicles, and aircraft. Within this, you'll have standard and heavy infantry, tanks and artillery, and a few types of aircraft. Infantry is strong against aircraft, but weak against tanks, for example. In the opening levels of the campaign, you can just throw down units at your leisure and most likely win, but harder difficulties will force you to consider what is most powerful at any given moment. When you're waiting for units to recharge, you can actually hover your hand over the pad and hold the trigger to reroute power to that pad and boost the charge until the unit is ready to deploy, which can help you get the right unit on the battlefield when things get hairy. One major issue I had with League of War: VR Arena, is that it doesn't tell much of anything when you first start playing. There's no tutorial, no intro, just into the menu and then into a match. A quick message during your first match gives you a basic description of each unit type. These messages say things like "Tanks are strong but slow," or "Recon units are fast but weak." They're helpful, but after that, there's no other tutorial to teach you any of the basics. Granted, it's not hard to figure out, but the trick about rerouting power is never mentioned once. I found the feature by accident. While the not the most complex strategy game, the lack of basic instructions doesn't offer the best first impression for new players. Once you progress through the campaign, you'll unlock the game's arcade mode. This mode allows you to spend your medals you win for victories in the campaign to build your dream squad that you can use against the commanders from the campaign. You can also have a second player join in with this mode. By grabbing a DualShock, they can play on the TV screen, while you battle in VR. The TV screen is a flat view of the battlefield with the pads laid out in front of you. Otherwise, it functions the same as the VR player. It's not anywhere near as engaging, but being able to fight with someone else does add some replayability to the game. The foundation here is very strong. Everything works well, and tracking is spot on. Where the game starts to get repetitive, is the lack of depth in the gameplay. There is some strategy, but not enough to truly have a style of play. Even something small, like unique special abilities or units for each commander, could have added some depth. Customizable units would have also been welcome. It's a fun idea that work really well, but it doesn't offer a lot of long-term replayability or strategy. League of War: VR Arena looks very nice inside of the PlayStation VR headset. The graphics are crisp and sharp, with no noticeable aliasing anywhere on PS4 Pro. The animation on units is smooth, and explosions are satisfying to watch from your perch at the end of the table. There are several battlefields to choose from, but they are all essentially the same design with different colors. You'll have one table with lush green grass and trees, and another with snow. A desert table mixes things up a bit, but each of them are purely aesthetic. The battlefield itself never changes from a flat landscape that allows your units to meet in the middle and clash at various points across the table. More detailed environments or a cover mechanic could have been another way to add depth to the experience. I sincerely hope League of War: VR Arena gets a sequel where they expand upon these ideas while keeping the excellent tracking, graphics, and mechanics. In the meantime, if you're looking for a simple and casual strategy VR title, League of War: VR arena does a great job of setting the stage. Just don't expect it to dive too deep into the genre.